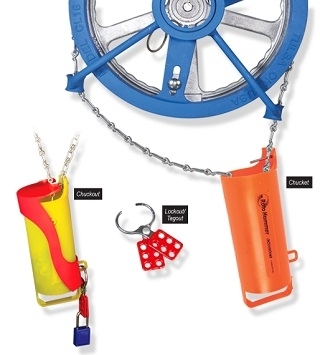 The Chucket Chain Storage Bucket holds overhead chain within easy reach and frees the pathway beneath, eliminating the safety hazard and hassle presented by suspended chain. The Chuckout combines the chain storage and safety features of the Chucket with an added Lockout/Tagout feature to prevent unauthorized access or operation of the valve. Please see PUB149-001 for further details.